Fidel Castro has given his support to the Egyptian protester in a newspaper column "The Revolutionary Rebellion in Egypt." Havana, Cuba (CNN) -- Former Cuban President Fidel Castro threw his support behind Egyptian protesters Monday, hailing the "defeat of the United States' principal ally in the bosom of Arab countries." In a newspaper column called "The Revolutionary Rebellion in Egypt", Castro accused Washington of looking the other way while Hosni Mubarak pillaged his own people. "We support the people of Egypt and their brave fight for political rights and social justice," he wrote. 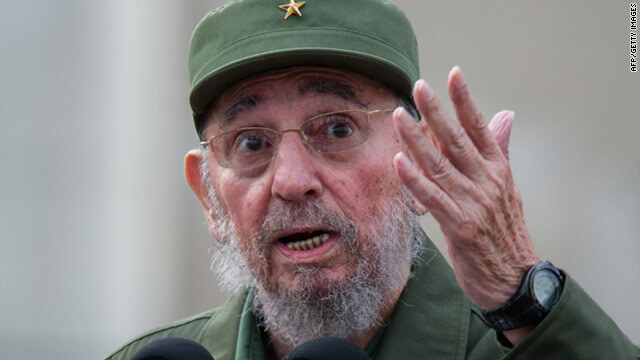 Castro was in power for nearly five decades after his own revolution defeated Cuban dictator Fulgencio Batista in 1959. He was forced to hand power to his younger brother Raul Castro in 2006 when he fell ill.
Cuban dissidents have also allied themselves with Egypt's young protesters, saying they too should try to use social media more to organize protests against the government. On the day of Mubarak's fall, prominent Cuban blogger Yoani Sanchez announced via Twitter, "Right now I feel like I am in Cairo. I shout and celebrate just like them," she wrote. "I call all my friends to tell them: there is one less dictator."